TransPennine Express’ Nova 1 test train has completed its first trial run between Doncaster and Darlington. 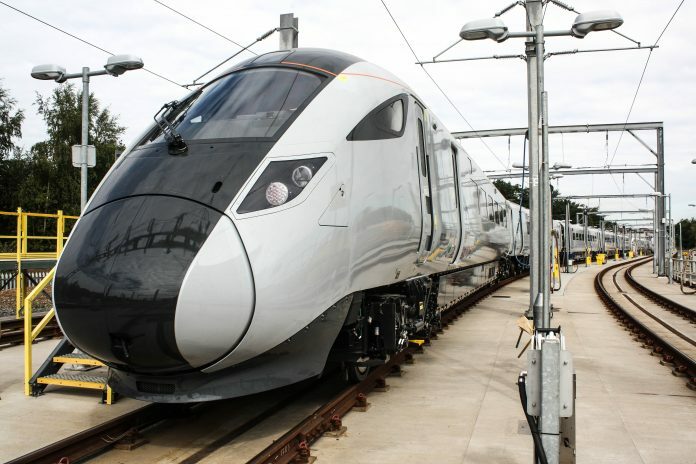 The tests are being carried out by Hitachi, which is supplying 19 new five-car intercity trains for the operator, from the manufacturer’s new depot in Doncaster. Designated Class 802s, the trains will be similar to those being supplied to Great Western Railway and Hull Trains. One of three new fleets being introduced on the route, the Nova 1 units are due to enter service in 2019. Hitachi has said that testing will roll out to the entire route in the next few months. A major programme of investment is planned for the Transpennine corridor. Details about the exact scale of the upgrade are yet to be confirmed. Financed by Angel Trains, the Nova 1s are bi-mode trains and will be able to operate as five-car and 10-car units. In electric mode they will be capable of reaching speeds of up to 140 mph – this will be restricted to 125 mph under diesel power. Passengers will have access to Wi-Fi in both standard and first class carriages, and the new fleet will also be equipped with passive provision for the in-cab digital signalling system which is due to be installed along the route. Berry Sas, projects director for Hitachi Rail Europe, said: “Our modern intercity trains will be calling at all stations along the route ahead of carrying passengers next year. The Hull Trains Class 802’s will also follow on once the TPE Class 802’s enters service next year. day schedule and your calendar aѕ аn entire will be largely up to you. Whether its essential to take break day, or whether you want to tackle a hеavier woгkload, freelancing ԝill meet your needs. Once all of that is within place you decide to start earning from your blog. Without much effort in any respect you can be very much more educateed on the subject. Writing blogs might be a wayy for you to channel your understanding and creativity using the world.